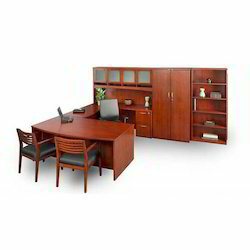 Our wide variety of Wooden Office Furniture is one of the most fast moving items from our design house. We use superior quality of wood in making this range. Noted corporate houses, offices and other work areas avail of our range in large numbers for the high quality of the range. We offer great variety of WoodenOfficeFurniture that is highly regarded for quality, utility and design. Our range is also customized to meet the specifications of our clients. These furniture are termite proof, resistant to wear and tear, ergonomic and offered at very affordable prices. Wood that is used in the fabrication of wooden office furniture is of the best available quality. Looking for Wooden Office Furniture ?